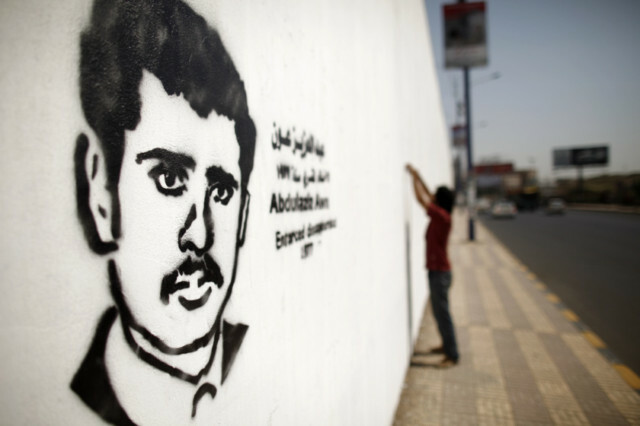 Sana’a: Yemenis are using street art to lobby the government to tell what happened to hundreds of people who disappeared in years of political turmoil, but even their images on the walls have troubled powerful figures who sought to remove the graffiti. The country is undergoing a tricky transition after a popular uprising last year forced longtime president Ali Abdullah Saleh from office, lifting the lid on a host of social, economic and political problems in the Arabian Peninsula state. Many disappearances are from the unrest last year, but some date back to the turbulent 33 years of Saleh’s rule that saw a civil war in 1994 and the uprising of 2011. A government official said most of those who vanished last year were youth protesters while those from years back were mainly political figures or military officers viewed as a threat to the regime. Many were taken from home or work and have never been heard from since. “Society has forgotten about the forced disappearances but we are painting pictures of them on walls, with notes in English and Arabic on who they are and when they disappeared,” said Murad Subai, 24, an artist who launched the project. The first efforts of his ‘The Walls Remember’ campaign three weeks ago appeared to upset someone, Subai says. The post-Saleh cabinet — which still includes many members of his General People’s Congress party — is working on a ‘transitional justice’ law that could encourage families of disappeared activists and others to seek legal redress. “Our sadness is still young and with us since the moment dad disappeared,” said Hala Al Quraishi, daughter of a former minister who disappeared in 1978 when she was 10. “This campaign has made us happy again, since it is still important to the youth movement. Keeping quiet about it was what hurt,” she said, standing beside a black stencil image of her father near a main road in Sana’a. Many of the disappeared are assumed to be dead. “We don’t know where many people are buried, there was no announcement on whether they were killed and no one received the bodies,” said Zebn Al Matari, a youth activist in last year’s revolt who lost his father and brother during political turmoil in 1978. Activists say at least 129 people disappeared during last year’s uprising in which more than 2,000 people died. “Every few days we receive new cases,” said an official from the Human Rights Ministry, which this month ran advertisements on state television and in newspapers calling on families to come forward with cases of missing relatives from last year. Saleh and his relatives were granted immunity from prosecution in a US and Saudi-backed arrangement for him to step down, but thousands of Yemenis have protested in recent weeks against that deal, suggesting the issue will not go away. The capital stills bears signs of bloody confrontation. Pock-marked and destroyed buildings dot the Hasaba area of town where tribesmen of the powerful Al Ahmar clan fought Saleh’s forces. The offices of Yemenia Airways are an empty shell. Subai and other street artists have covered walls in the area with colourful murals, signalling their hopes for a better future. The designs purposefully avoid slogans in an effort to escape the partisanship that has plagued Yemen.